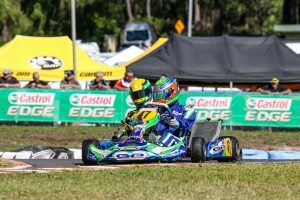 In a day that saw drivers forced to overcome challenging conditions, several new faces shared the spoils during the opening day at round two of the 2019 SP Tools Australian Kart Championship, presented by Castrol EDGE, in Newcastle. With heavy rain making a delay to the start of competition due to the circuit being flooded, officials were forced to abandon qualifying and the heat race grids were set from practice times. Victorian Matthew Smith broke through for his first win in the elite KZ2 class in the opening heat. 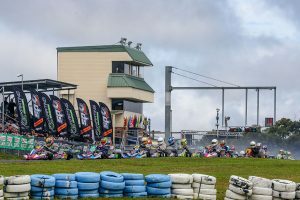 The GP Karts pilot made the most of his opportunities while championship leaders Troy Loeskow and Chris Hays struck trouble. Loeskow bounced back in heat two, but another DNF in the third heat race – won by Jason Faint – will see the Ricciardo kart driver start 14thin tomorrow’s fourth heat. In the KA4 Junior class – it was Harrison Mitchell who won his first national level race, as did Noah Sands in the KA2 class. Ladies Trophy leader, Beck Connell claimed a pair of wins in the over-subscribed KA3 Senior class. In Cadet 12, Alex Ninovic secured two victories as Lewis Franics and Kristian Janev greeted the chequered flag first in the other two heat races contested. The Pro Karting pair of Jason Pringle and Adam Lindstrom will occupy the front row of heat four in TaG 125 after showing strong speed throughout today’s proceedings. Championship leader, Brendan Nelson, recovered from starting down the field in the opening two heats to take out the third heat race win. In Cadet 9, Tom Williamson Motorsport driver James Anagnostiadis leads the way, while Kosmic driver Pierce Lehane took a clean sweep of proceedings in the X30 class. Sunday’s action will begin at 8am with the final round of heat races ahead of the finals beginning late morning. All of the action will be streamed live on www.karting.net.auand through the Australian Kart Championship Facebook page.